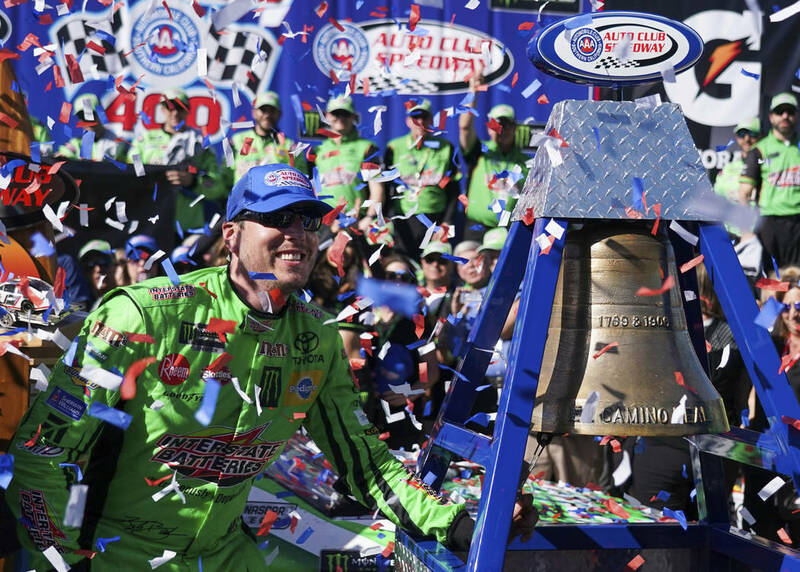 Because this is modern day sports, virtually the second Kyle Busch crossed the finish line at Auto Club Speedway Sunday he was handed a giant flag commemorating his 200th win across NASCAR’s three primary touring divisions: Cup, Xfinity, Truck. And then it was “Gentlemen, start your comparisons” to Richard Petty, whose victory total the Las Vegan matched after recovering from a speeding penalty and slicing and dicing through through the field like a finely tuned Veg-O-Matic. Actually, the comparisons to Petty began last year, when Busch won eight Cup races — which is a lot in today’s level-the-playing-field NASCAR — and began to creep up on The King’s rear spoiler. Then, as Sunday, Busch said because his victory haul came across three divisions, it does not compare to Petty’s, which was all in Cup. Then, as Sunday, he also was prone to making braggadocios claims about the talent in his right foot. “All I do is win, win, win, no matter what,” Busch said over the car radio in his No. 18 Joe Gibbs Racing Toyota before being handed the giant flag marking victory No. 200. That much is true. Busch, 33, can really haul the mail, or whatever commodity you want to strap to his engine spacer as NASCAR tries to eliminate his competitive edge (and Kevin Harvick’s) at the front of the field. But can his 200 wins be compared to Richard Petty’s? It’s like listening to baseball fans in a Cooperstown tavern debating the statistics of Willie, Mickey and The Duke. Before the season-opening Daytona 500, Busch said he never would compare his victory total to Petty’s. “Absolutely not because his number is obviously Cup wins and mine’s not,” said the Durango High graduate, who was 20 when he won his first Cup Series race in 2005, also at Auto Club Speedway. Petty also demurred. He suggested guys who work on old Buicks — and other racing fans — make too much of the numbers. Guys who work on old Buicks probably will tell you that if three NASCAR touring series had existed during the crux of Petty’s career, and had he raced in all three, he might have won a bazillion races. Or as many as ol’ Red Farmer. But NASCAR is vastly more competitive in Busch’s day than it was in Petty’s: One year (1965) at Darlington Speedway, Ned Jarrett — one of Petty’s few rivals when guys raced with a pack of Winstons rolled up in their T-shirt sleeves — won by 15 laps. Somebody check his engine spacer. There also were more Cup races back in Petty’s day than there are in Busch’s. In 1964, there were 62 races. In 1967, there were 48. Petty won 27 times. That was almost like Old Hoss Radbourn going 60-12 with 73 complete games for the 1884 Providence Grays, with the exception that Old Hoss arrived at the ballpark in a horse and buggy instead of an old Buick. And those who pontificate about such matters should not forget that Petty and Busch drive the fastest cars on the circuit, with the best pit crews and sponsors. How many races would Petty have won driving Tiny Lund or Ramo Stott’s car? How many would Busch have won last year in Matt DiBenedetto’s or Michael McDowell’s? Here’s a better idea how to determine who is the better driver between the King and Kyle: When NASCAR returns to Las Vegas in the fall, put them in identically prepared Ford Country Squire station wagons during rush hour traffic. Have one start at the Rainbow U.S. 95 on ramp, the other on Tropicana. See which one gets through the Spaghetti Bowl first. Beyond that, it’s all engine noise.